Businesses live and thrive on their people. That means that as generations change, businesses have to change with them. Creating a fast, smooth, and engaging experience is what modern employees have come to expect. At the same time, businesses are increasingly turning to the cloud for the most agile and cost-effective software. At the meeting point of these two trends is SAP SuccessFactors – a cloud solution for the modern workforce. So what are the most compelling reasons to move to SAP SuccessFactors? Over half of your workforce will be millennials by 2020. These youngsters have grown up with flexible working, digital collaboration, and slick user experiences as the norm. Making the move to SAP SuccessFactors brings your HR into line with those expectations. You can encourage employee learning and development wherever they are, while removing the delays and paperwork that turn them off. Cloud solutions are perfect for when budgets are tight. The monthly subscription model of SAP SuccessFactors is a powerful argument for small to medium sized businesses. On top of that, the modular SAP SuccessFactors licences mean you can add any functions as and when you need them. As an SAP-hosted solution, customers don’t need to think about maintenance. Administration is also simple, as many functions can be learned from free training videos on the SAP SuccessFactors Community site. SAP SuccessFactors includes a mobile platform as standard, unlike many on-premises solutions. Your HR team can work with recruiting, to-do list management, and performance and goal management on the go. The preconfigured options in SAP SuccessFactors offer fast integration with other SAP solutions and many non-SAP providers in payroll, benefits, time and attendance, and document management. For more complex SAP SuccessFactors integrations, Influential Software’s clients benefit from our partnerships with Dell Boomi and MuleSoft. SAP SuccessFactors receives upgrades four times a year, ensuring you always have the latest innovations. For customers who want to upgrade in their own time, we can assess your needs and perform targeted mini-implementations. The user interface of SAP SuccessFactors is a huge improvement over on-premises HR solutions. This means you can keep your HR team just as happy as the workforce they’re serving. Like any HR solution, SAP SuccessFactors is only a tool. It’s up to each business to define its HR strategy before implementing it with the best software. Making the move to SAP SuccessFactors is a great chance to review your current HR strategy and air fresh ideas. Getting the most out of these benefits is a matter of experience and expertise. As an SAP Gold Partner with 25 years of success in the software domain, Influential Software provides the SAP SuccessFactors services to make your move a breeze. Our partnerships with leading integration providers Dell Boomi and MuleSoft also ensures that HR is perfectly aligned with all your systems. 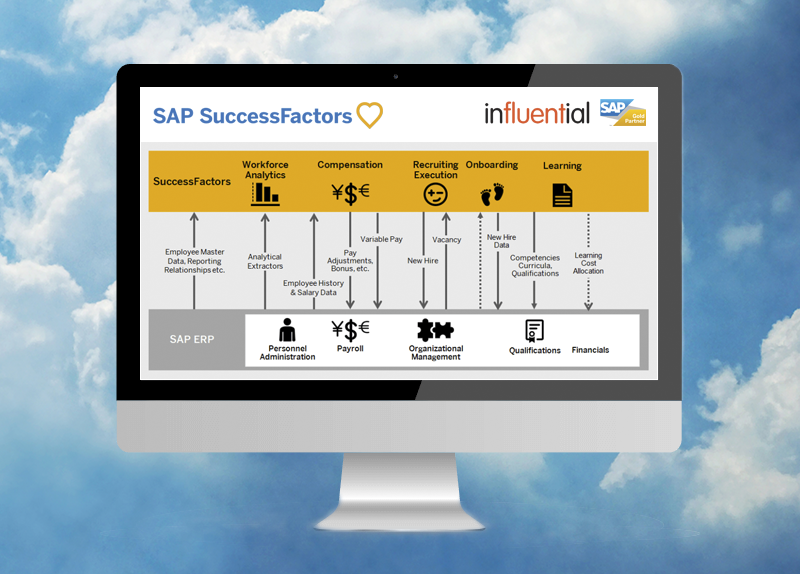 Interested in learning more about SAP SuccessFactors? Feel free to visit our dedicated website.